“The Last Stand” – Reviews Dribble In, Looks Weak – But Hey, Arnold’s Back! 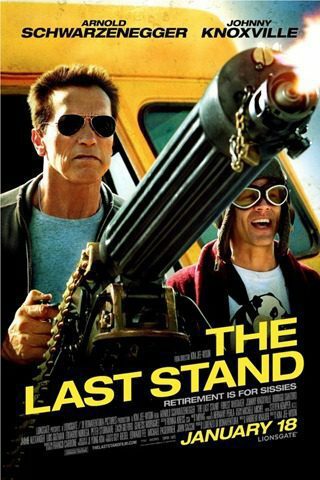 Arnold Schwarzenegger’s The Last Stand premieres Friday, January 18th. This will be Arnold’s first lead starring role in a movie since Terminator 3: Rise of the Machines in 2003. In the intervening years, he made several cameo roles, most notably in the last two The Expendables movies. It may have been a while, but there are still a lot of Arnie fans out there. Since debuting as an actor in Conan the Barbarian in 1982, Schwarzenegger has starred in films that have grossed over $1.7 billion dollars to date. His time as Governor of California took him away from acting for a while, but his cameo and supporting roles in The Expendables seem to have validated that he’s still popular with the viewing public. In The Last Stand, Schwarzenegger plays Ray Owens, the sheriff of a small town. Owens used to be a big time cop in Los Angeles before a humiliating failure ended his career there. In the film, he has to gather his small town troops and pull himself up to stop a big-time drug mogul trying to escape to Mexico through his town. In some ways the plot mirrors Schwarzenegger’s life. He’s a larger than life star who has suffered some embarrassing setbacks to his public persona. Now an aging actor, he has to become a box office star again to put himself back in the limelight. At least he has a good supporting cast, including Johnny Knoxville and Oscar-winner Forest Whitaker, to help him out. Will The Last Stand be Schwarzenegger’s big comeback, or his last hurrah? Do you think Arnold will rise above his public relations troubles and become a star again? Let me know in the comments below!